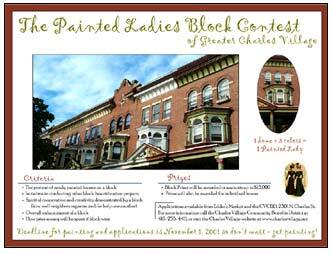 The above is a poster for the Painted Ladies Block Contest sponsored by the Charles Village Community Benefits District in Baltimore. The four-color poster was laminated and posted around the neighborhood, and winners received posters to hang inside of their windows at the end of the contest. For the large format art, I photographed area houses and then digitized the images and manipulated them to resemble watercolor paintings of the homes. 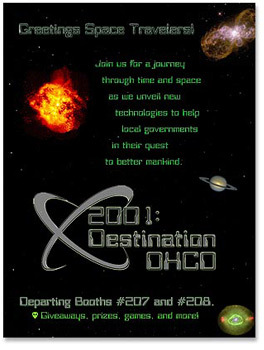 The above is a poster promoting the space-themed booths of the MD Department of Housing and Community Development at a State conference.